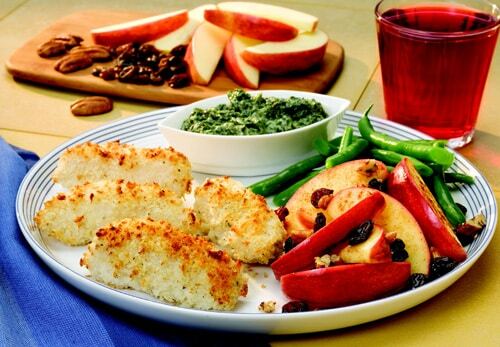 Classic comfort foods with a modern twist, these easy-to-prepare fish sticks and spiced apples served with a glass of 100% cranberry juice will please all finicky youngsters. 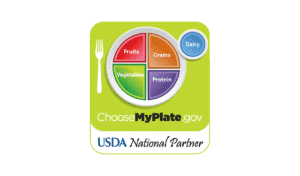 Created by our friends at Produce for Better Health it fits into MyPlate recommendations. Place rack in center and heat oven to 450°F, and spray cookie sheet with cooking spray. To make dipping sauce, place all ingredients in a blender or food processor; blend or process until smooth. Cut pollock into strips 1-inch wide (easiest when fish is partially, rather than fully, thawed) and place on prepared baking (cookie) sheet. Mix breading ingredients (bread crumbs, parmesan cheese, and pepper) in a shallow dish or pie pan; place flour and egg whites in separate dishes. Dip fish sticks in flour, then in egg whites, then breading mix, coating evenly. Return coated fish sticks to baking sheet, spacing evenly. Cook fish until it is 145°F, confirmed with a food thermometer, about 10-12 minutes, golden brown, turning as needed. While fish sticks are baking, cut apples in quarters and core them; slice into smaller wedges (about 12 per apple). Toss with raisins, pecans, and cinnamon. Heat butter in medium sauce pan. Add fruit mix. Sauté lightly about 3-5 minutes. Apples should still be slightly crisp.